Bins So Clean Monthly Service guarantees the highest level of protection against harmful, illness causing bacteria and odors. 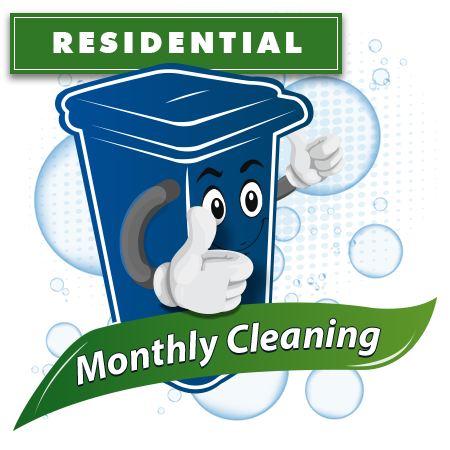 Cleanings occur every month, and service is billed quarterly for your convenience. Add additional Trash, Recycling, or Yard/Organic waste bins for just $5/each! Select the number of each bin you would like us to clean, then click Sign Up to get started! If you don't wish to have a particular type of bin cleaned, please select "None" from the dropdown for that bin type. Bins So Clean One-Time Cleaning is a good introduction to our service. For 1 month you'll have the same Clean, Sanitized, and Deodorized bins as our monthly subscribers. We're confident that once you see (and smell!) the difference in your bins after our service, you'll be hooked! Add additional Trash, Recycling, or Yard/Organic waste bins for just $5/each! Need Pressure Washing? Get a Custom Quote!